When I worked full time in a corporate office, I was not very responsible when it came to my lunch choices. In the beginning I made more of an effort to bring my own lunch, but it wasn’t long until I fell into the habit of eating out or bring a microwavable meal. I was just too busy and wanted something easy. 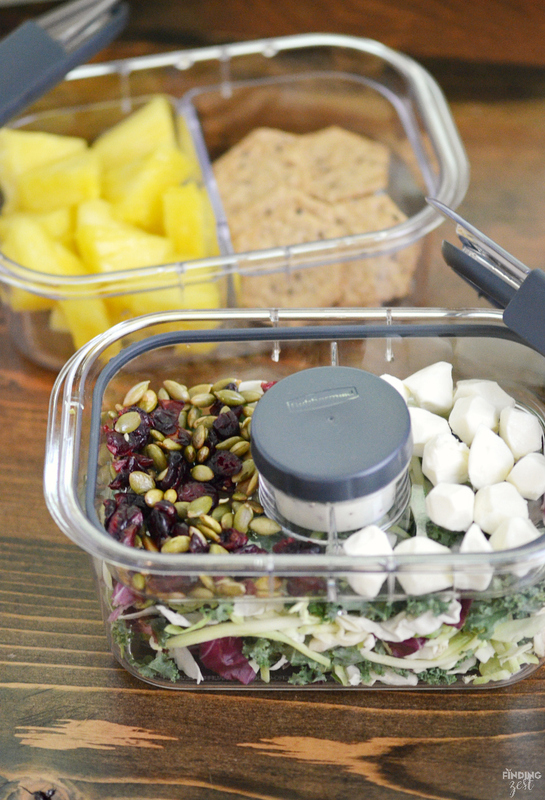 But now, there are so many more delicious lunch ideas and new ways to easily bring them on the go like the Rubbermaid® BRILLIANCETM Salad & Snack Set, especially if you try this easy salad kit lunch hack! Doesn’t that look like a delicious, yet healthy lunch? 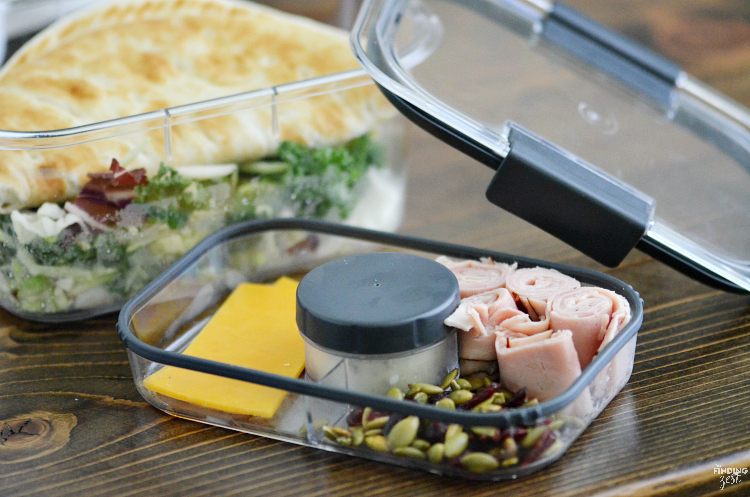 This 9 piece lunch set is the answer to keeping your entire lunch fresh and organized. 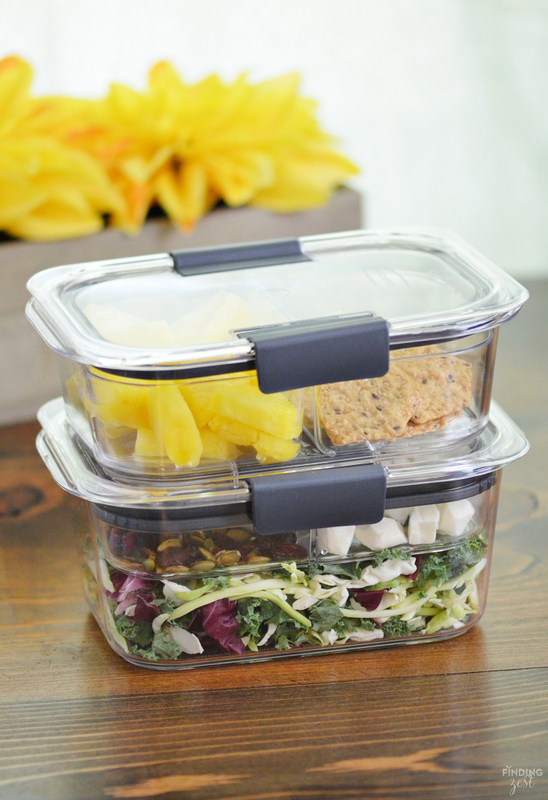 With build in dividers, tops that lock in place and containers that stack, keeping your lunch together has never been easier. 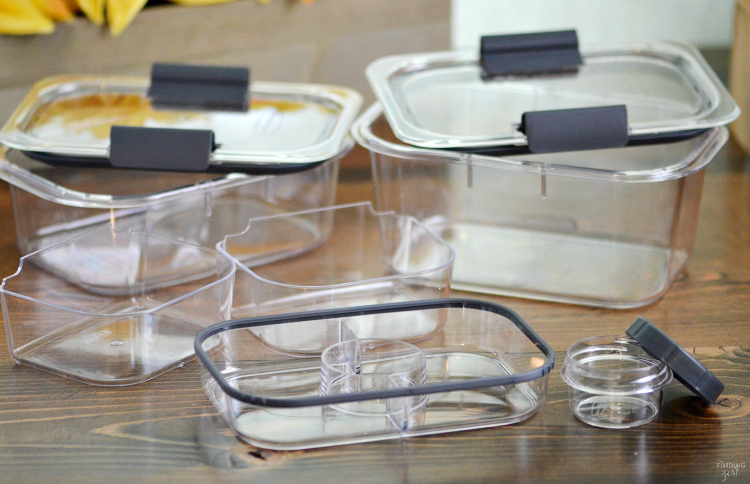 I love that these stain resistant food storage containers also make perfect meal prep containers. 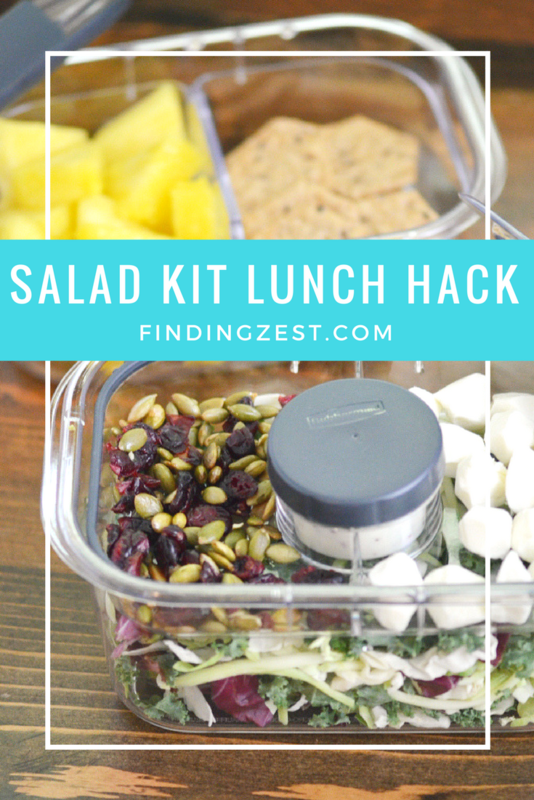 Salad kits are a great way to enjoy a variety of salads but they are hard to enjoy at lunch because they typically include more than one serving. 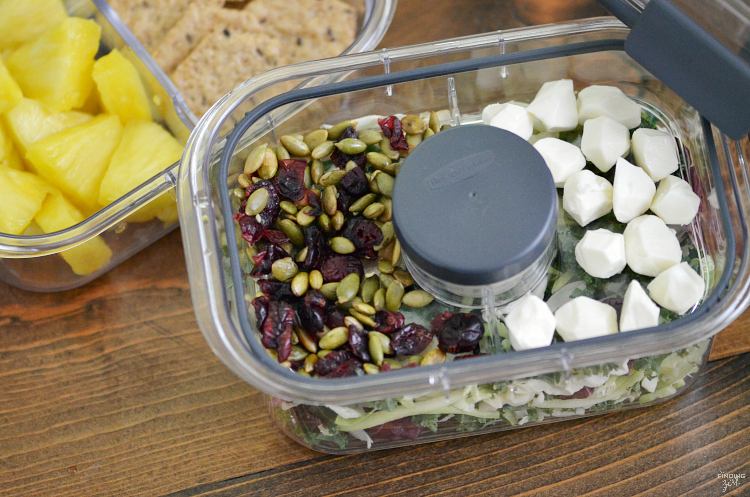 Dividing them up in the Rubbermaid BRILLIANCE Salad & Snack Set is a great way to still use salad kits but keeping them fresh and spread out through multiple days. For this lunch, I put together divided up my favorite salad kit into two days worth and added in some fresh mozzarella cheese pearls. For the next day I switched things up and added flatbread, deli ham and cheddar cheese. Load up a flatbread (or tortilla) with the prepared salad and your other favorite fixings! The snack section of this set can be used to store additional lunch items to enjoy with your salad or as snack options throughout the day. For the snack set I added some fresh pineapple and multi-grain crackers. For day two, cheddar cheese cubes and almonds were the perfect snack choice. Don’t feel for a salad? You can use this Rubbermaid set for anything you want! Try loading them up with fresh veggies and instead of salad dressing add your favorite veggie dip or hummus. Include a tortilla, leftover chicken and a portion of a Cesar salad kit for a killer Caesar salad wrap! 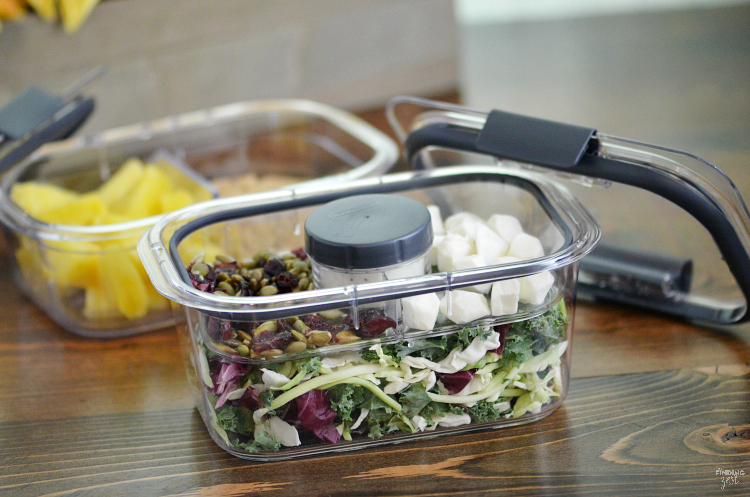 What would you put in your Rubbermaid BRILLIANCE Salad & Snack Set? 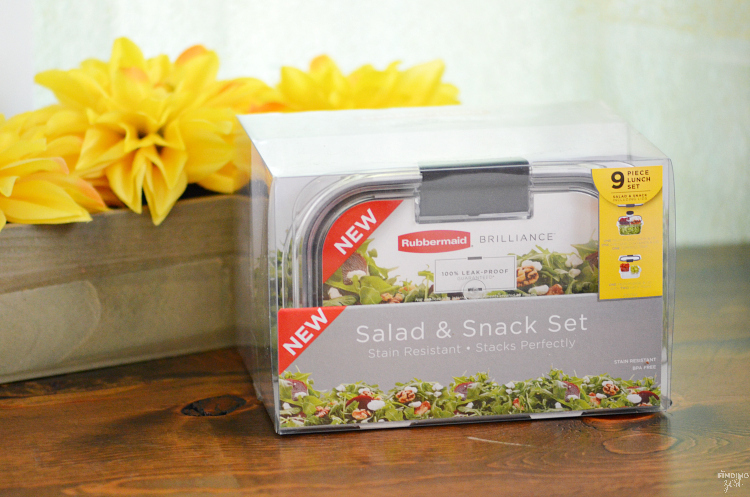 I have one Rubbermaid BRILLANCE Salad & Snack Set to give away to one lucky reader! I like chicken noodle soup for lunch. My favorite lunch is a turkey and cheese deli sandwich on fresh bread. My favorite lunch is a veggie wrap with an apple. Chicken salad, with grapes and pecans. My favorite is a bacon, lettuce and tomato sandwich. I enjoy having a chicken salad sandwich and fruit for lunch. I love salads for lunch! I like salad with chicken and avocado. My favorite lunch is grilled cheese and tomato soup! These are great ideas. Sometimes I pack grilled chicken salad. Leftovers! haha. I love bringing in dinner for lunch the next day, it beats a sandwich! I love chicken salad–with lots of fruit and nuts! I like leftover steak from the night before chopped and served on top of a big green salad. I love having salad for lunch, but I also really enjoy warm leftovers like meatballs and soup. I really prefer a homemade lunch over going out. Ham and cheese on rye is a favorite of mine! Grilled cheese and tomato soup is the best lunch. I like Chicken Salad with fruit and almonds for lunch. My favorite lunch is soup and a sandwich. I like chicken salad for lunch! My favorite lunch is a ham and Swiss sandwich with tomato and spinach leaves. My favorite lunch is a nice fresh salad. I love a salad and a grilled cheese sandwich. I love chicken salad and fruit. My favorite lunch is a cobb salad. I like having salad with hard boiled egg and vinaigrette. I’ve been really enjoying a salad with chickpeas and lentils lately. I like a cheese quesadilla for lunch. But, I’d give this to my DIL. She likes salads for lunch. I love a fresh veggie salad with lots of apples, nuts, and blue cheese! I love a great chicken wrap for lunch. I like having salads for lunch! I eat almond butter toast pretty much everyday! My favorite lunch is salad and pizza. I love almost any kind of panini sandwich, but a favorite is turkey and brie. My favorite lunch is a sandwich with chips. I love having a spring mix salad with walnuts for lunch and dressing. I love chicken wraps with fruit and pretzels on the side. My favorite lunch is usually something with meat and pasta. One of my favorite lunches is a garden salad with Starkist Sweet and Spicy tuna on it. I love chef salads for lunch! I love a garden salad and fruit. chipped turkey sandwich with mustard and pickles. I like a chicken caesar salad for lunch. My favorite lunch is tomato, avocado and hard boiled egg salad. My favorite lunch is a small salad, sandwich and some fruit. I like a tuna fish salad sandwich. My favorite lunch was the cedar plank salmon from a restaurant down the street from where I worked. My favorite lunch is tuna sandwich. Thanks for the chance to win such an amazing giveaway. I love salads and sandwiches or when the weather is cold, soups and salads or sandwiches.